When your child has a fever, you know what it's like to wait it out. 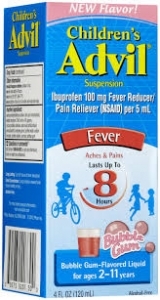 Children's Advil® Suspension reduces fever fast – even faster than Children's Tylenol®. It lasts longer, too – up to 8 hours with just one dose. And Children's Advil® also relieves aches and pains. This product does not contain directions or complete warnings for adult use; do not give more than directed; shake well before using; find right dose on chart below. If possible, use weight to dose; otherwise use age; repeat dose every 6-8 hours, if needed; do not use more than 4 times a day; measure only with the dosing cup provides. Dosing cup to be used with Children's Advil Suspension only. Do not use with other products. Dose lines account for product remaining in cup due to thickness of suspension. Under 2 yr, under 24 lb, ask a doctor. 2-3 yr, 24-35 lb, 1 tsp. 4-5 yr, 36-47 lb, 1-1/2 tsp. 6-8 yr, 48-59 lb, 2 tsp. 9-10 yr, 60-71 lb, 2-1/2 tsp. 11 yr, 72-95 lb, 3 tsp.